Great Danes have very strong sporting instincts, and they may be easily taught to retrieve. Curiously enough, the writer has known them have tender mouths, and many times her dogs have brought rabbits they have caught, quite unhurt; while the same dogs would kill a strange cat with one bite of their strong jaws. She has also noticed that some of them, whilst walking upwind and getting the scent of birds or rabbits in front, will draw on them very like a Pointer. The Great Dane hunts mostly by sight, but he can also use his nose with quite remarkable success in tracking his master or while hunting in covert (pg. 49-50). In that same section on the Great Dane, there is mention of one of the Dukes of Buccleuch owning a Great Dane that lived to be 18 years old. Although we have no confirmation of that, we know that modern dogs of this breed have real issues with longevity. 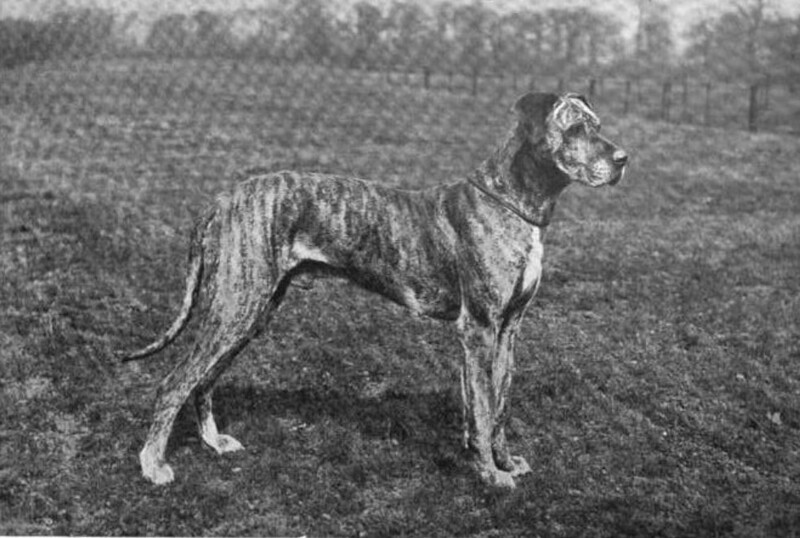 The author of this section is Violet Horsfall, the owner of the brindle dog in the photograph at the top of this post. There is often a tendency in certain sectors of that fancy in those days to exaggerate a bit, especially if there were questions about the health and longevity of this breed in the eyes of the dog owning public. She is quite cavalier about inbreeding them (which isn’t that unusual, especially in those days), and she seems to go out of her way to point out how hardy they are. Is she accurate or she being defensive? However, that is not why I mention it here. The Dukes of Buccleuch were those who refined the various smooth-coated St. John’s water dogs that were found in England at their properties and those of the Earls of Malmesbury into the modern Labrador retriever. There is no mention of this Great Dane doing retriever work or of this dog being crossed with the Labradors. But it is pretty interesting. Likely nothing more than an interesting coincidence. It is a German breed that is more accurately called the German Mastiff, the direct translation of its German name (Deutsche Dogge), or simply call it the “boarhound,” which was the common name for this breed in much of the English-speaking world.